Djabe’s 1998 album was the second in the band’s history. The double CD was recorded in their own studio which was just finished at that time. 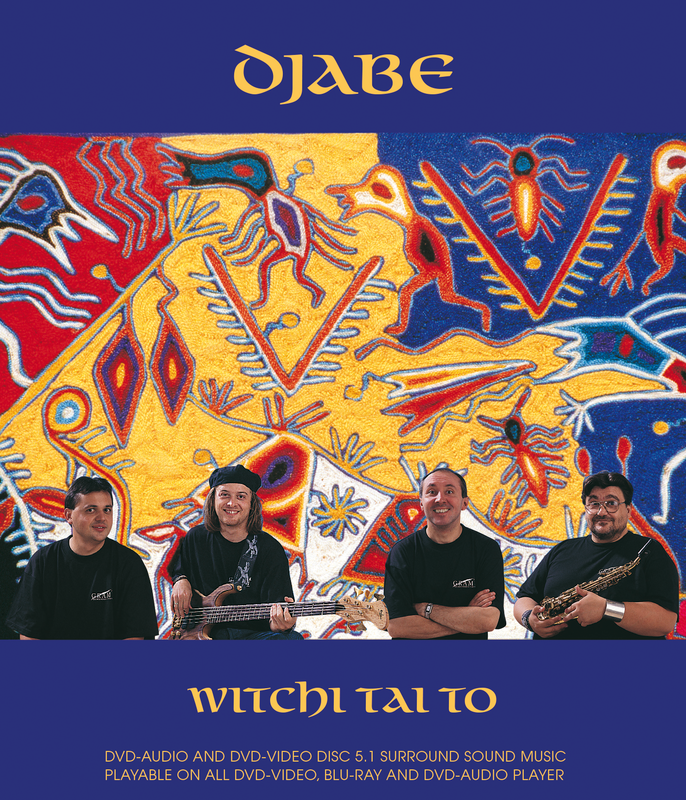 The music was the work of the first, quartet formation of Djabe: András Sipos – vocal and percussion, Ferenc Muck – saxophone, Attila Égerházi – guitar and Tamás Barabás – bass. The album was a huge success and both the professionals and the listeners took to it well. It was nominated to the Hungarian Music Awards, and received the prize in World Music category (2000 – Golden Giraffe prize). The double CD was unique in the packaging too, which was made of paper, digipak. This new case format was not so wide spread then, and it was ordered from the Netherlands. The Witchi Tai To album had other international elements too. On the second disc, in which there were remixes for radios, placed the so called ‘Enhanced partition’. With an interactive menu you could play videos, and read a lot of information about the band, and with a weblink you could log on to Djabe’s website. This new form of release which had just begun to spread in the music world could have been produced at the legendary Abbey Road Studios in London that time only. So the production was made both at Gramy and in the former creative place of Pink Floyd and the Beatles. The CD and Vinyl LP versions became very popular among the High-End auditoriums and Hi-Fi fans, and made it renowned until this day. In 2013 Djabe renewed this legendary sound. The music itself sounds fresh even today, and the past 15 years “matured” the production and the listeners’ ears as well. The original tracks were remixed completely by Tamás Barabás, the sound engineer of the band. He not only kept the sonic values of the original CD but improved them as well, and the result could be the test record for lovers of quality sound. This is very true concerning the surround version, because in 5.1 the sound is more plastic, every fine detail of the recording the acoustic instruments are detectable, even those ones which would disappear in stereo version. The new 2014 version is a one DVD disc edition, at the high quality “Djabe” standard. The format is double sided DVD 10, so there is content on both sides of the DVD. The first side of the disc can be found the DVD Audio content. This layer can be played with DVD Audio compatible devices. DVD audio layer contains the high resolution uncompressed MLP (24 bit/96kHz) stereo and 5.1 audio tracks. The whole original album can be listened to in this high audio quality plus one bonus track, Visions, recorded in 1999. The other side of the DVD is video format; it can be played with all DVD and Blu-Ray players. On this layer, the full album can be listened to, plus the 1999 Visions in stereo (PCM) and in 2 types of 5.1 (DTS and Dolby Digital). The video layer of the DVD contains visual extras too, from the original Enhanced CD, but in better quality of course. The film Djabe Live 1997 recorded in Budapest. In between the 1997 Pecsa concert’s songs there are the interview parts with members of the band. Djabe and Coffee Break video clips made for the radio mixes. These videos are really extras, as they were not existed at the time of the original release. All elements of this anniversary edition are managed to surpass the high standard of the original album. It is true about the videos and audios as well.